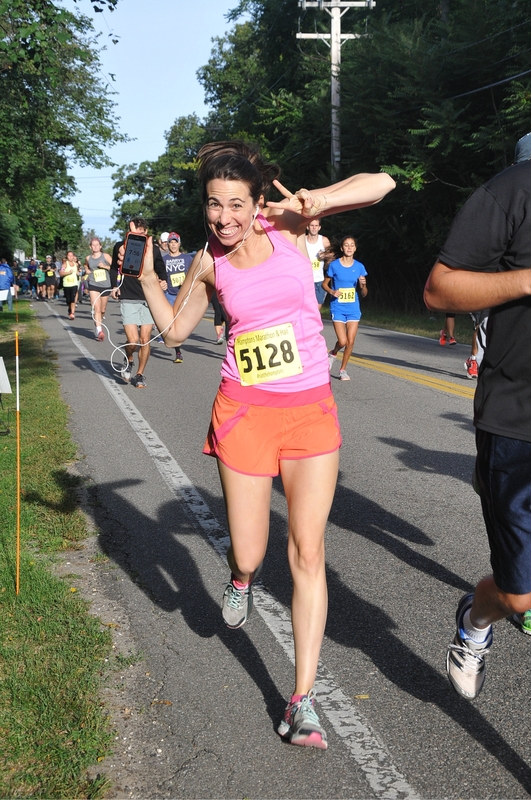 Five friends signed up for the Hamptons Half Marathon and I registered for the accompanying 5K. 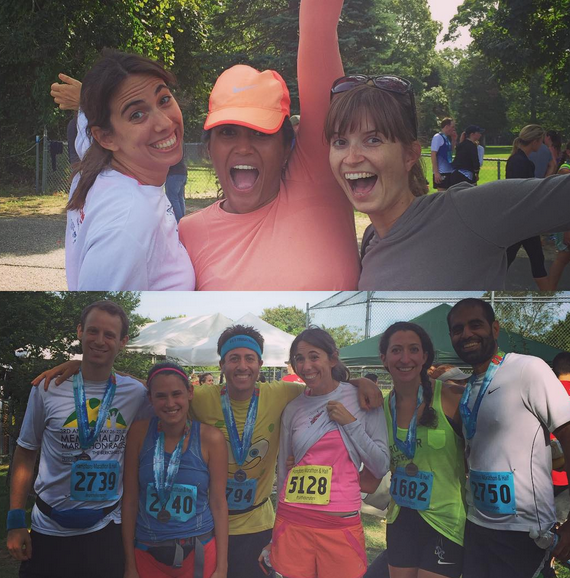 Two lovely ladies joined us for the weekend and came out to cheer, so our group made eight in East Hampton. Cheerers on top, runners on the bottom. (I’m in both because I cheered on the half after the 5k), combined this group ran over 90 miles! When I signed up months ago, I was nervous I wouldn’t make it to the starting line. 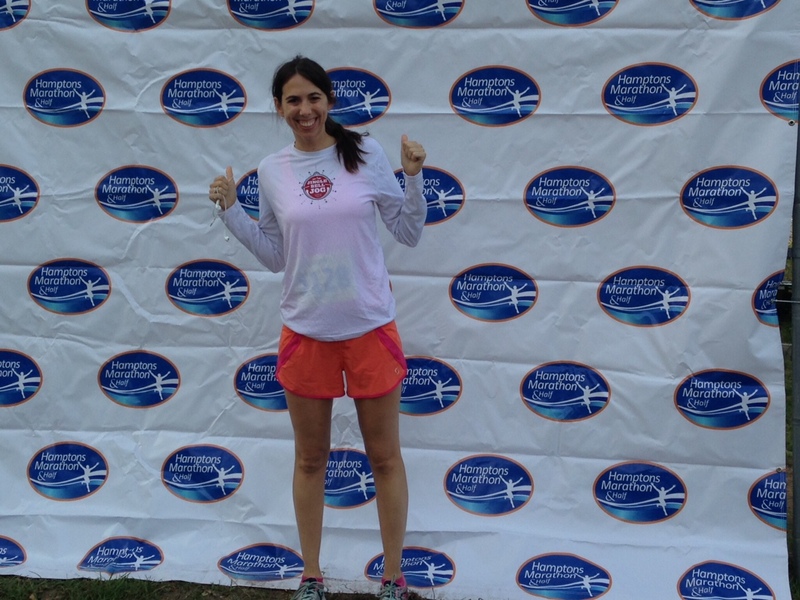 I registered for so many races that I had to opt out of because of injury. It was a victory just to get to run and I felt elated to be there. We got to the race early so that four of the half marathoners could run extra miles before the starting line in order to create 18-mile and 20-mile long training runs in prep for NYC Marathon. The weather was perfect, low 60s with lots of sunshine. At 8am, after finishing the pre-runs, the half marathoners were off and I meandered toward the starting line for the 8:15am 5K gun time. 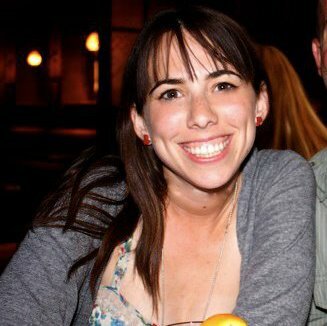 I’ve been running a few times a week (usually 2 or 3) for a little over a month and the excitement of an actual, real race totally electrified me. I found his narration charming, and since I planned on using Strava anyway it made no difference to me. I was in such good mood as I waited to run 3.1 miles. The clock ticked toward 8:15am and I put on my headphones and cued up some Fetty Wap. I say it as a point of pride and embarrassment that I know every single word to “Trap Queen.” I did a little dance to keep warm at the starting line. When the gun went off, I started out too fast. I’m typically good at starting out slow and building momentum, but I was so excited for this first race, and plus Fetty had pumped me up. I hadn’t run a 5K for time in a long time and wasn’t sure how slow to start to get negative splits. I don’t typically talk about pace here but I think in this instance it helps tell the story. The first .5 mile I was running sub-8s. That is very, very fast for me. I wrestled internally about how long I could hold it for. The answer? Basically about the length of Trap Queen, twice. I continued on, still faster than expected but a more sustainable pace until I approached the turnaround. I hadn’t looked at the course map at all. My friend Katy ran the 5K last year and said it was flat, so I didn’t bother to investigate further. I didn’t know it was an out and back race until I saw a few speedsters running past me in the other direction as I approached the turnaround. I still felt good, though I don’t know how to switch directions without slowing down. Is it possible? Can someone explain? On the way back, I saw a few runners a head of me and kept thinking, you don’t need to pass them, keep doing what you’re doing but before I knew it they were behind me. I guess the speed caught up to me. At mile 2.7 I felt a gnarly stitch in my side. This used to happen a lot when I first started to run, but hadn’t happened in recent years. Usually the pain comes when I start out too fast. I tried to keep going but I started to feel my legs stiffen. I slowed down for a second to a walk and then I stood still and stretched my hands over my head for a moment, but not more. I was so close and really wanted to power through. I couldn’t go as fast as before but with such a short distance left, I tried not to slow too much. Eventually I made the final turn to the finishing line – with my fastest 5K time yet. Then I keeled over and my stomach pain finally went away. I met up with my spectating friends and we went out to cheer for the half marathoners. All in all a fantastic race day experience! Sounds like a nice race even if the 5k was the step-child of the event. 🙂 Congrats on finishing your first race in a year. That is a big achievement. Thank you so much. It was a great race.